I think it’s because I’ve previously mentioned on some blog posts that I like to buy stuffs on Taobao so I’ve had some people writing to me and asking questions about the shopping process. 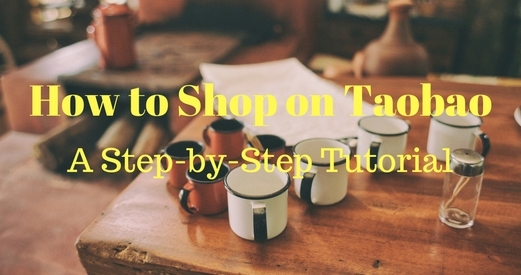 Hence, I’ve prepared a step-by-step tutorial on how to shop on Taobao like a pro. This post will come in handy for 11.11 (happening on this coming Friday) which is China’s Black Friday, the biggest online sales day of the year. 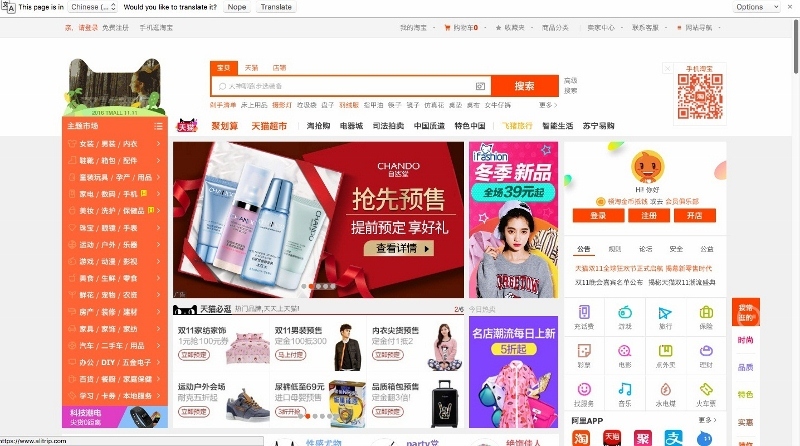 For those who are not familiar with Taobao, well it’s an e-commerce platform under the Alibaba Group that’s based in China and it’s similar to Amazon, Rakuten or Qoo10 except that everything on the website is in Chinese. 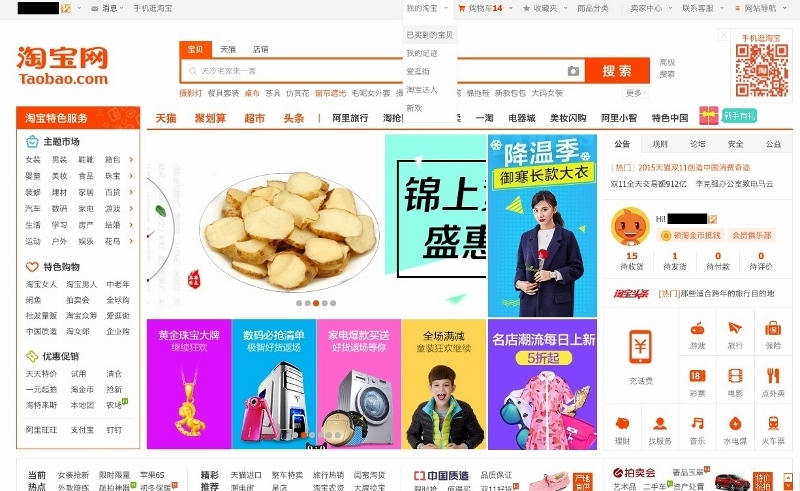 Unless you understand the language, otherwise shopping on Taobao can be quite challenging. But don’t worry, I’m here to show you how. 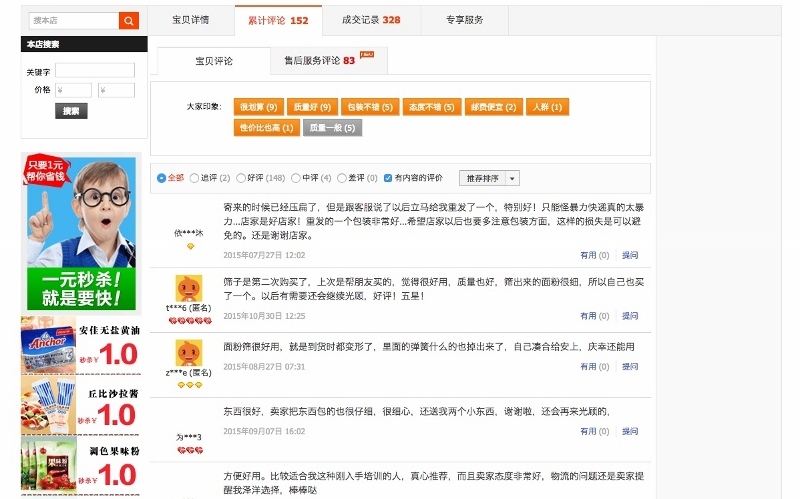 Even though I can speak and read Chinese, I did encounter a lot of difficulties initially while navigating through the website, trying to look for the products I want and contacting sellers (and conversing with them in Mandarin on chat) when I had questions. I couldn’t find the right words to use and then it dawned on me that perhaps I didn’t have a good grasp of the Chinese language especially after leaving school for too long. Also, the Chinese language in China and what we have learnt here in Singapore since young are a little different. For example, potato in China is called 土豆 (‘tu dou’) but here we call it 马铃薯 (‘ma ling shu’). Spoon is read as 汤匙 (‘tang chi’) here but 勺子 (‘shao zi’) in China. Before we begin, I would suggest that you use the Google Chrome browser as it provides an option for web page translation which will come in handy while shopping on Taobao. If Chrome is already your default browser, please clear your history and cache before proceeding with this tutorial. While this is quite a detailed tutorial (I hope so), it is probably still easier to grasp the know-hows if you can at least read some Chinese. Otherwise, just use Google translation all the way. 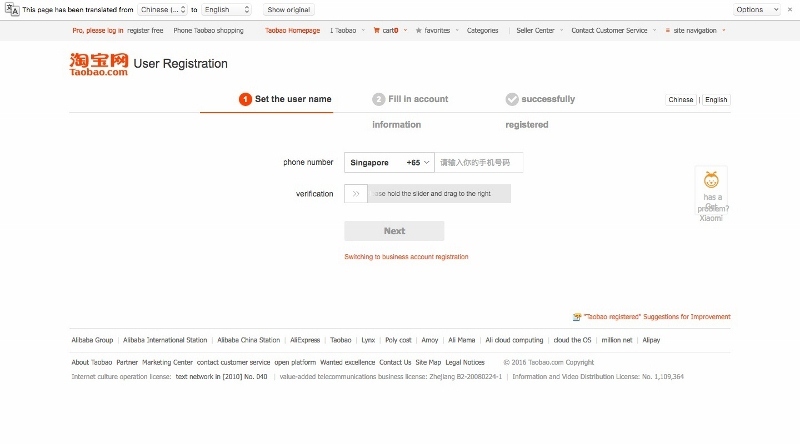 When you type the URL (www.taobao.com) on your browser, you might be redirected to its global platform world.taobao.com because your IP address is based in Singapore. On the top left corner, point your mouse cursor over 新加坡 (Singapore) and then select your region as 中国大陆 (China) from the drop-down menu. 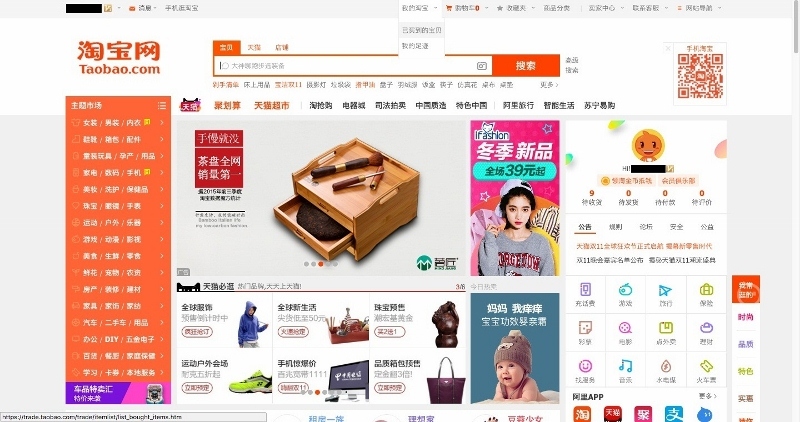 You are now at the original China Taobao page which is where you want to do all your shopping. Translate the page to English. Web page may look a little funny but that’s fine. Click on ‘register free’ on the top left. You should come to here. 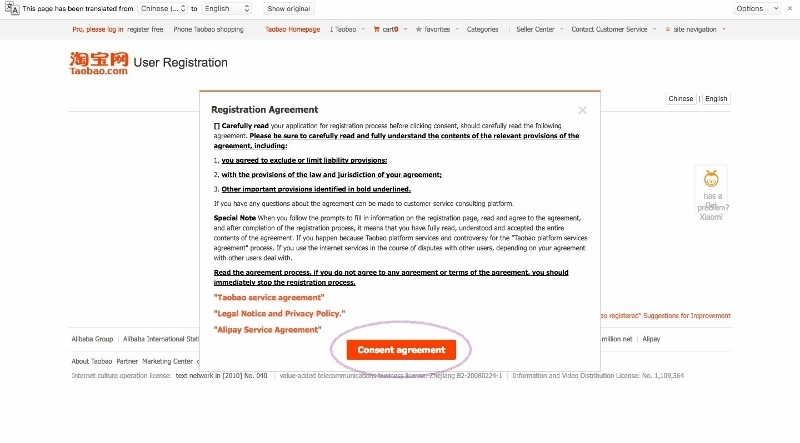 Click ‘Consent agreement’ (to agree to the terms & conditions). The registration process from here onwards is pretty straightforward. And your account is set up. Select 海外其他 (Overseas/Others) from the 所有地区 (Region) drop-down menu and input your address and contact number. Once done, click 保存 (Save). Go back to the Taobao homepage. 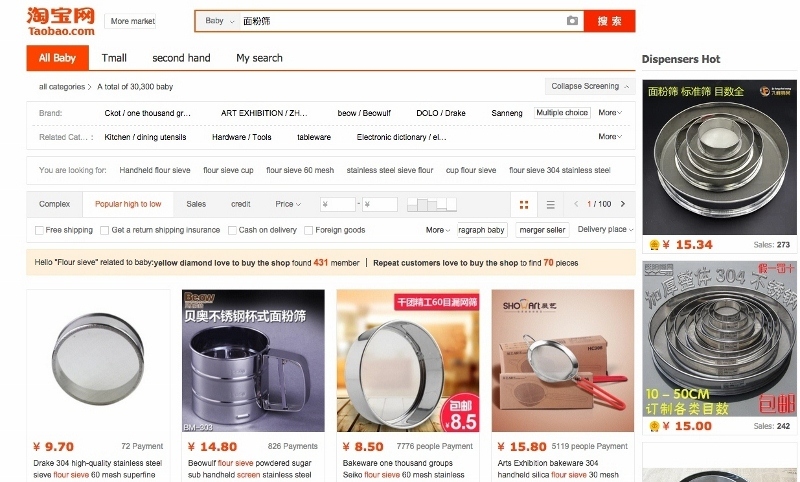 If you know what the item you want is called in Chinese, use your existing Chinese input editor and type in the Chinese characters in the search box on Taobao homepage. Otherwise, open a new tab on your browser. 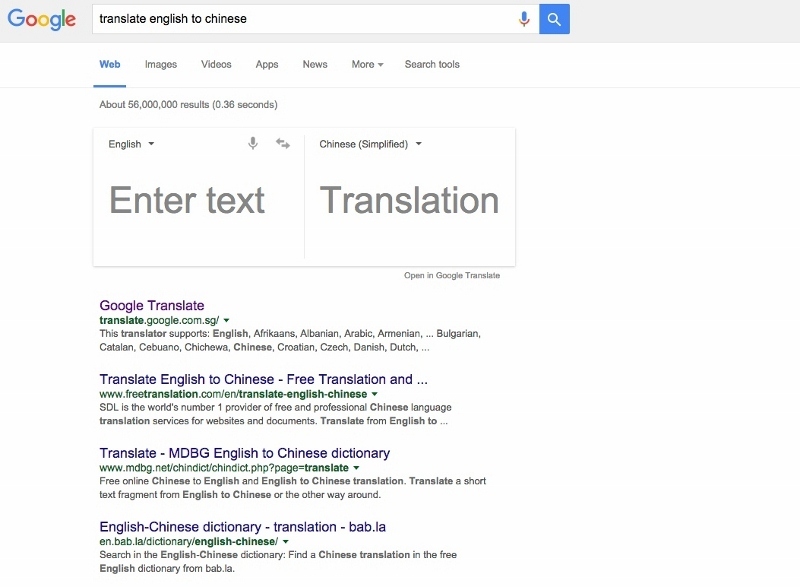 Type in the Google searchbox ‘translate english to chinese’ to get this online translation tool. 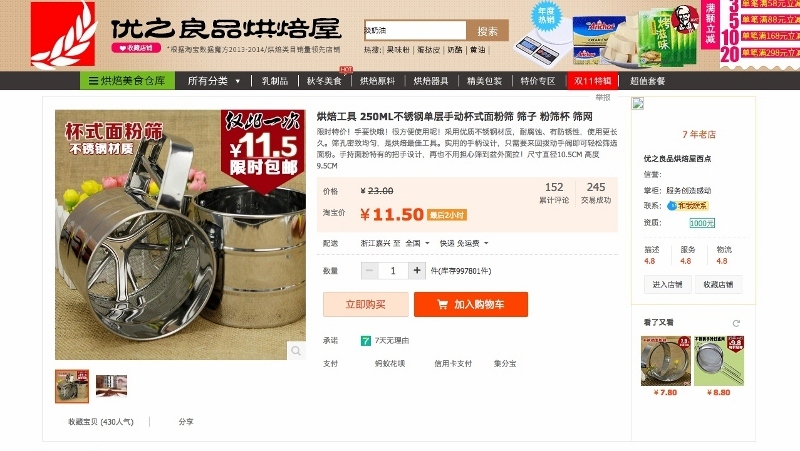 For example, I want to find out what a ‘flour sifter’ is in Chinese. 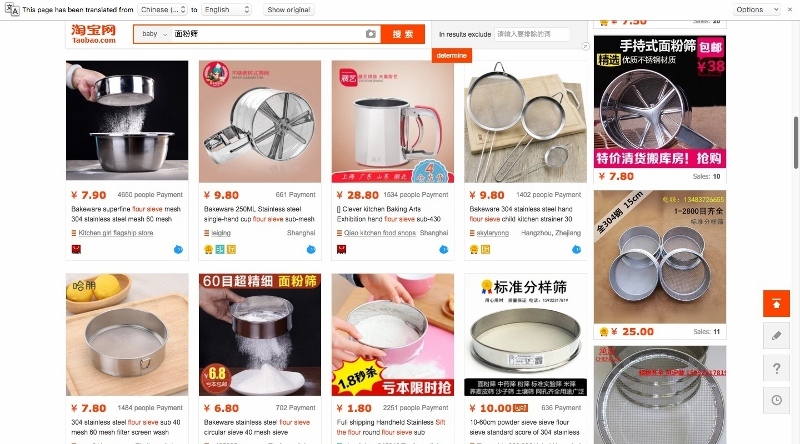 Next, just cut and paste the Chinese characters into the search box on Taobao homepage to see what are all the available flour sifters for sale. 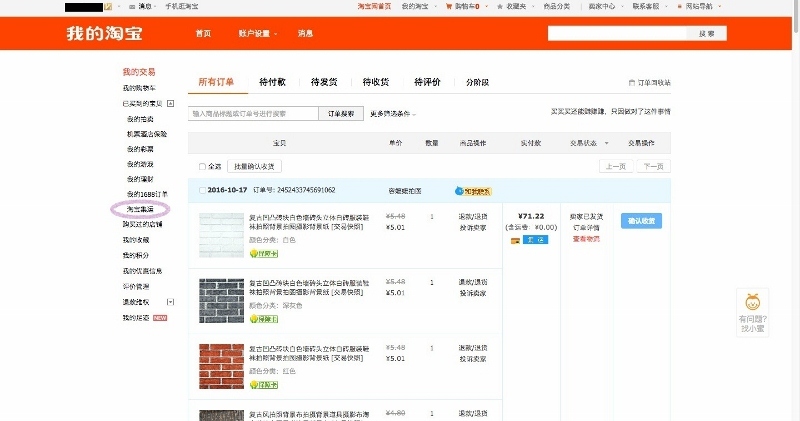 Researching is probably one of the most important aspects while shopping on Taobao as there can be hundreds or even thousands of different shops/sellers that sell the same product. 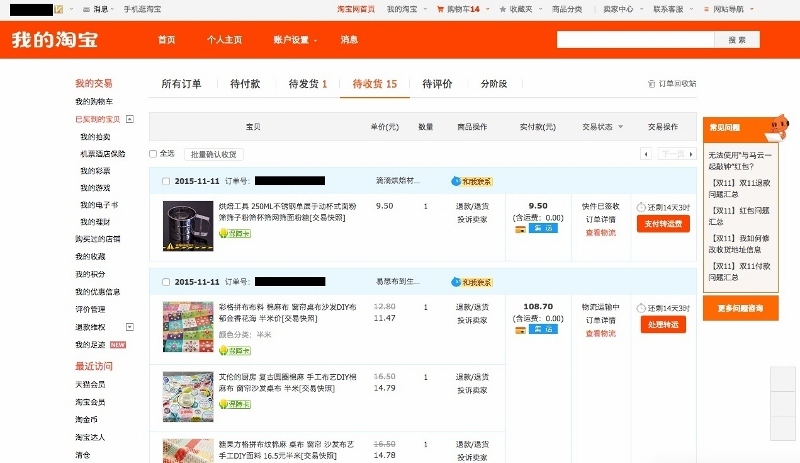 Under every product image, you will see the price (in RMB) on the left in orange colour and the number of people who have ordered/paid for the product on the right. I would normally compare the prices between several shops/sellers (scroll down and go to the next page, etc) so as to get an idea on the ‘standard price’ of the product. I mean, you wouldn’t want to be paying $50 for something that only cost $20 in other shops. You may want to consider a shop/seller who has made a considerable amount of sales for that particular product. For example, 550 people have ordered T-shirt A but only 3 have ordered T-shirt B. Both t-shirts are of the same design/material and of the same price too but I will still be more inclined to pick T-shirt A. It is also very important to check seller’s reputation. Once you’ve shortlisted the product you want after considering the two points as mentioned above, click on the image to go to the item page. 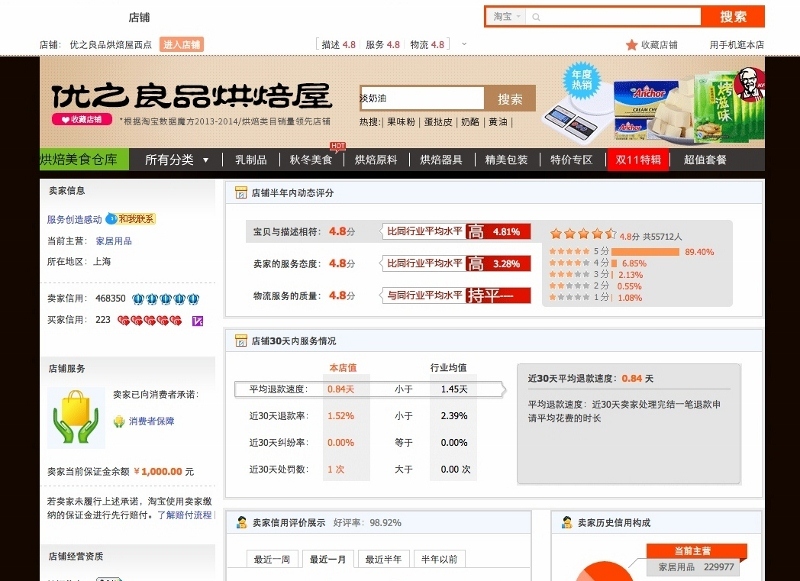 On the right hand side, you can see the ratings for the shop based on 描述 (Item Description), 服务 (Service) and 物流 (Delivery). The figures in red (‘4.8’) are the ratings out of a maximum 5. Click on any one of the number rating to go to their main seller ratings page. Item Description: Do actual products fit true with the images and description provided? Service: Is seller prompt at answering queries? Does seller assist customers appropriately when they encounter problems with the product? Do they provide good packaging? Delivery: Does seller mail out items on time? Is their delivery/courier service reliable? Is the speed of delivery fast enough? Scroll down to read the reviews from past customers who have bought the product. Translate the page to English if you’re having difficulty reading Chinese – that may not be 100% accurate because Google will just translate word by word and some sentences may not even make sense but should be good enough to give you a rough idea. If everything’s good and you’re happy with the shop/seller, then click Back to return to the item page. Below the item price, you will see this line “配送 [seller’s location] to [must select 全国 here]”. It just means ‘delivery to anywhere in the whole of China’. Some sellers offer free delivery but some do charge a domestic courier fee (from seller’s locaton to warehouse) which will be added to your cart later on. If you scroll down below to the item description, you will sometimes see a note that says delivery will be free with a certain mininum purchase which means you will have to add more stuffs from the shop to your cart to be able to enjoy free delivery. 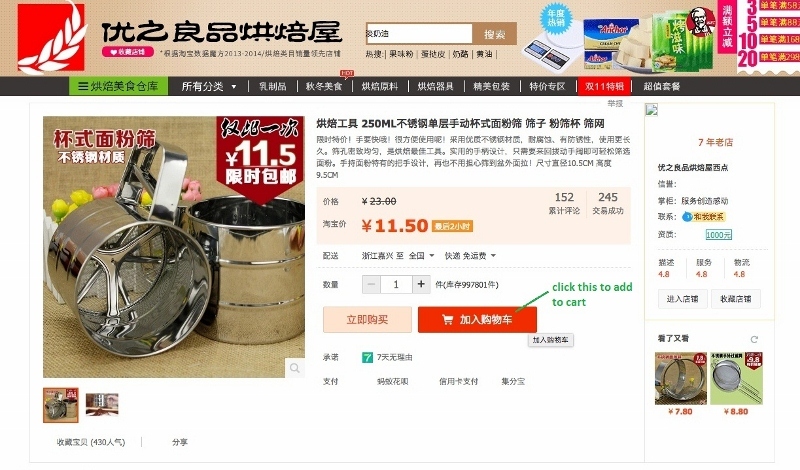 To add item to cart, click on 加入购物车. You can now repeat all the above steps to search for other products and continue adding them to your cart. Each cart checkout can take up to a maximum of 50 products. These 50 products can be from different shops/sellers and is not dependent on product quantity. That means if you select 5 pieces of Handbag A, it is still considered as ONE product. 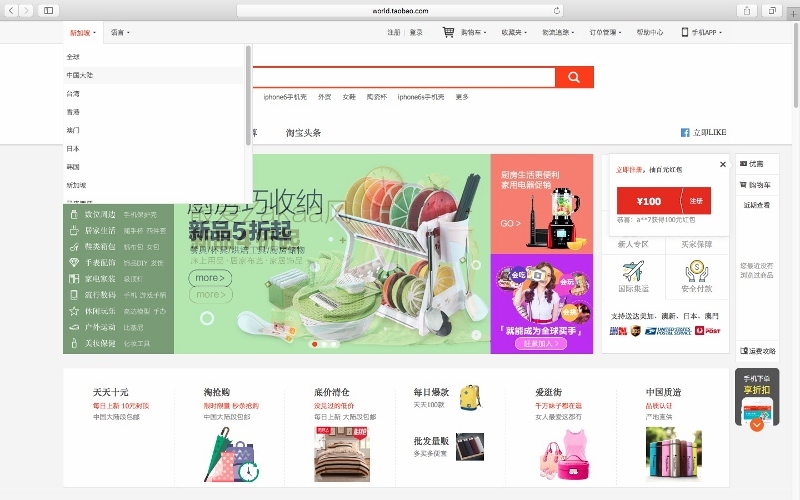 When you’re done adding items to your cart, click on 购物车 with a shopping cart icon at the top of the page. On your shopping cart, make sure all your products are checked in the box. On the bottom grey bar, you will see the number of items selected as well as the total amount payable (excluding domestic/overseas shipping). Click on 结算 on the bottom right. You will come to this page. 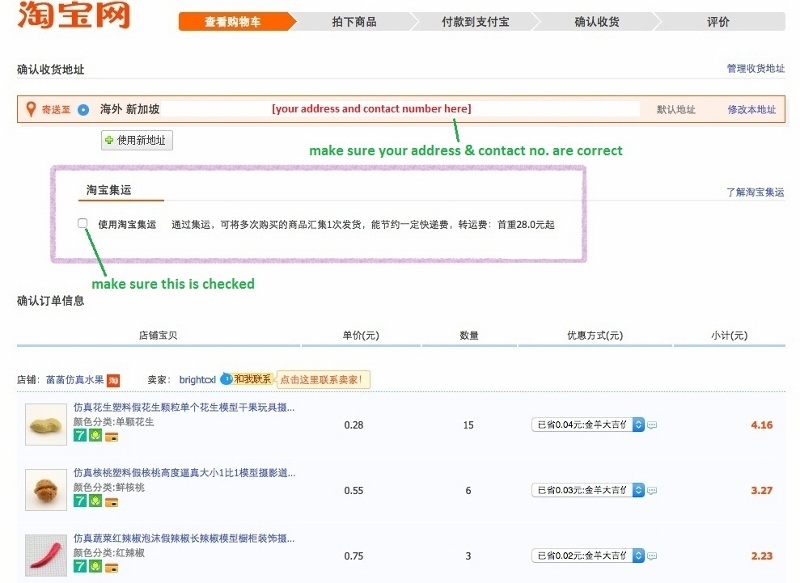 Check that your address and contact number are correct and make sure the checkbox under 淘宝集运 (consolidated shipping) is checked. It just means all your orders will be sent to the warehouse of your selected freight forwarder (which you will choose later on) and it will consolidate all your parcels and re-direct/deliver them in one shipment to you. Scroll to the bottom and click on 提交订单 to submit your order. On the next page, you can select your freight forwarder. I normally go for 4PX. They may be the most expensive compared to the rest but they have been very responsive and reliable so far. Once selected, click 确定 at the bottom to confirm. 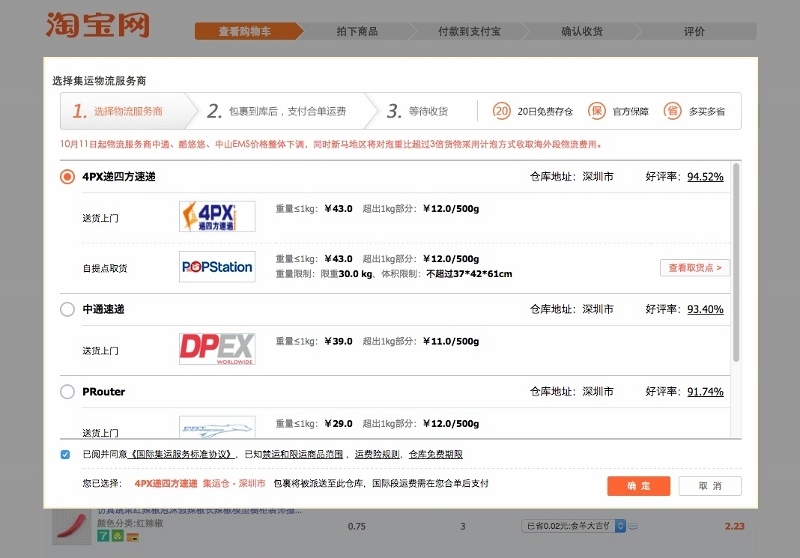 You will be asked to create an Alipay account which is Taobao’s e-wallet similar to Paypal. This payment that you’re making is only for the total product price and domestic courier/delivery charge if any. As of September 2016, eNets is no longer available as a payment option so we can only pay via credit card. Do note there will be an extra 3% surcharge for credit card payment. Fill in your credit card details and click CONFIRM at the bottom. To see what you have purchased, click on 我的淘宝 -> 已买到的宝贝. Here is where you can get updates about your orders – what have arrived at the warehouse, what has not been sent out by seller, etc. Do note whenever a parcel reaches the warehouse and the freight forwarder receives it on your behalf, a SMS notification will be sent to your registered mobile number. Once all parcels have arrived at the warehouse, you are ready to consolidate orders and have everything shipped to you. Click on 我的淘宝 -> 已买到的宝贝 -> 淘宝集运 (on left column). Select (check the boxes) all the orders you would like to consolidate in one shipment. 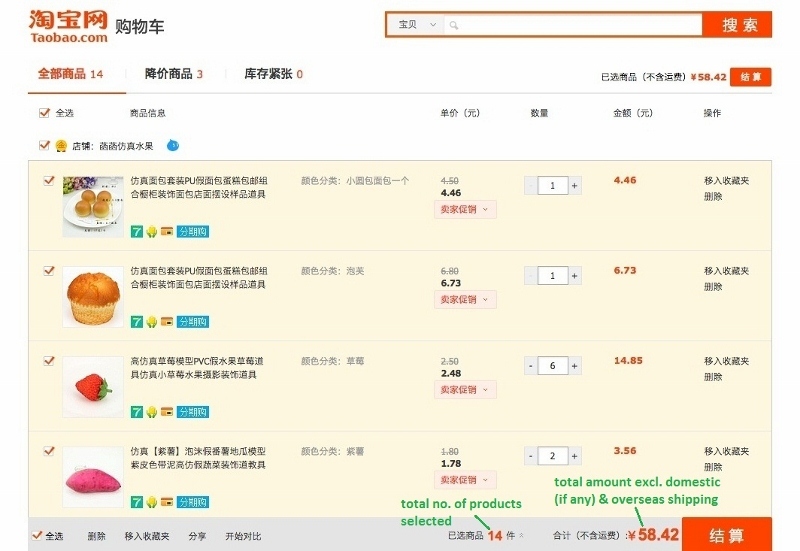 At the top of the little pop-up window, you will see the number of consolidated orders, total weight and total shipping fee. Each shipment can only accommodate up to 30kg of goods (from not more than 20 different shops/sellers). If the total weight of your parcels exceeds 30kg, you would have to split up the shipment into 2 or more separate ones. Similarly, if you have ordered items from more than 20 different shops or sellers, you’ll have to split up the shipment too as each shipment only accepts a max. no. of 20 shops/sellers i.e. 20 parcels regardless of no. of items. Make sure the first bullet on top is selected and check that your address is correct. This option means the shipment will be delivered to your doorstep. If you select the 2nd bullet option, it means you are opting for self-collection at the local freight forwarder’s warehouse. If you select 4PX as your freight forwarder, the local handlers in Singapore would be either SingPost (Speedpost) or Airpak Express. Scroll to the bottom and click 提交并支付 to submit your shipping order and to make payment. You will be directed to Alipay page where you can make payment via credit card. There will also be a 3% surcharge. And you’re done! Now you just need to wait for your stuffs to come! Click on 我的淘宝 -> 已买到的宝贝. Click on 淘宝集运 (on left column). Click on the tab 海外物流订单 and click on 物流订单详情. And you can see a detailed summary of the shipping status. All the parcels will be packed in a big sack bag like this. Open the sack bag and unwrap your parcels. Remember to check the condition of every item and also make sure your order is accurate. Otherwise, you should contact seller immediately to have the problem rectified asap. 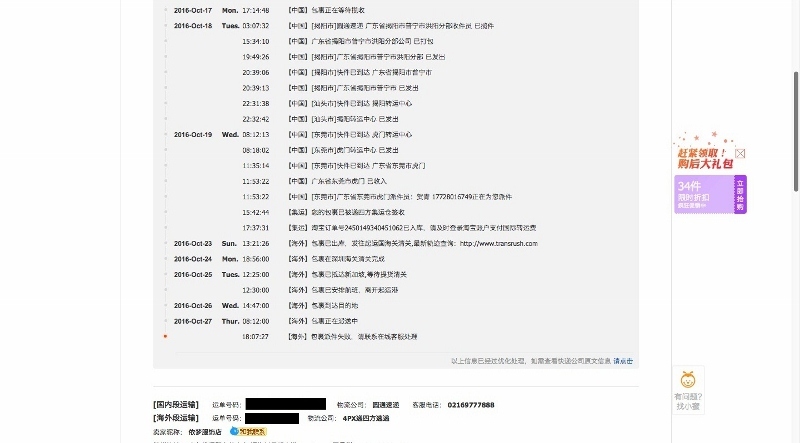 Taobao auto-releases money to sellers within 10 days (can be extended by another 3 days) and if you don’t take action in time, it will be too late to request for any refund thereafter. 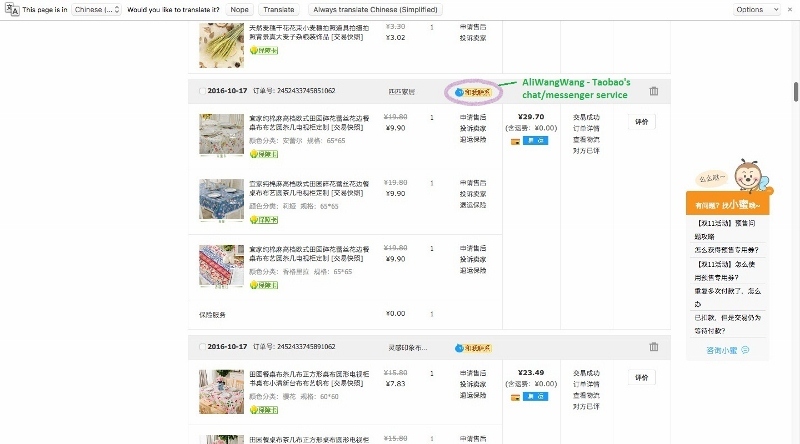 Should you need to contact seller, you may do so via Aliwangwang which is Taobao’s chat/messenger program. Having speedy delivery is very important so all your parcels will reach the warehouse in time. For example, you’ve ordered products from 10 different shops/sellers. 9 packages have arrived at the freight forwarder’s warehouse and 1 is still on transit somewhere. The warehouse only offers free storage for 20 days and if you exceed the 20 days without checking out your parcels in time for re-direction/delivery to your home country, there will be a daily charge incurred. And if you decide to have the 9 parcels delivered first and arrange the delayed parcel to be in a separate shipment, you will incur more delivery fee for that delayed package as you’d need to re-pay that first kg fee instead of paying lesser for subsequent 500g. Hence, try to go for sellers with good rating/reputation in delivery. Contact the seller on Aliwangwang to let them know you’re consolidating orders at warehouse for overseas shipping so kindly ask them to process your order quickly. Are you buying fragile/breakable items? 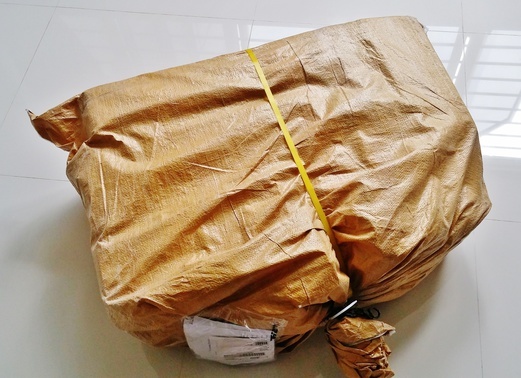 Chat with seller on Aliwangwang to let them know your parcel is to be shipped overseas so have them pay more attention to packaging and reinforce the packing materials as necessary. I didn’t do that once and the plates I ordered came broken into pieces because the box was too filmsy. 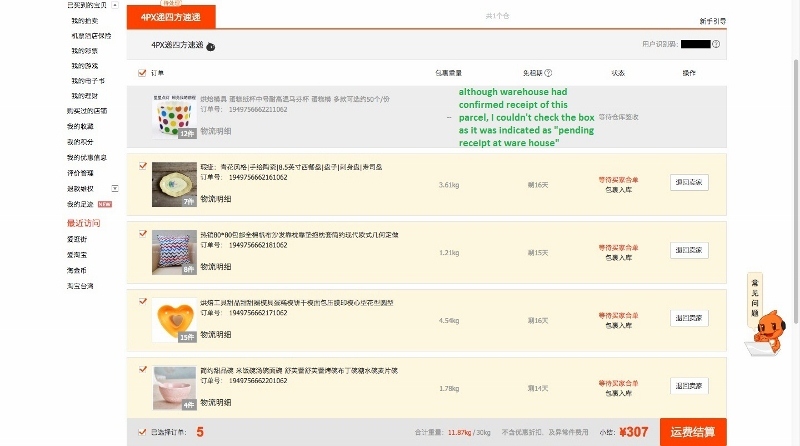 Taobao has a system similar to Qoo10’s Q-points. 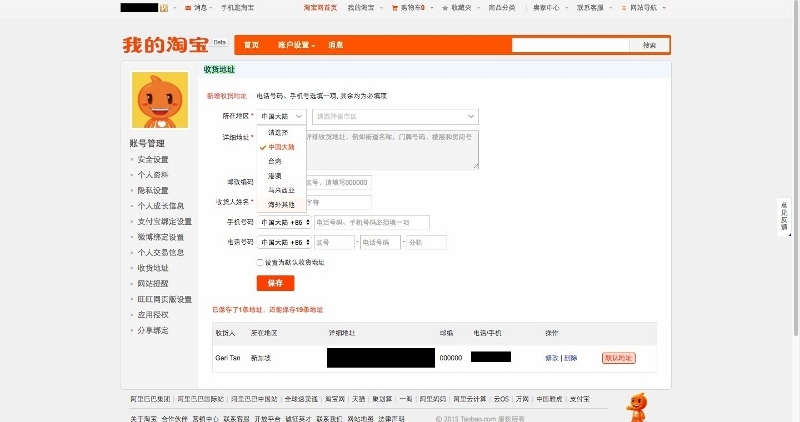 You can log into Taobao daily to receive a reward (领淘金币抵钱) which you can then use to offset your purchases. For sellers who do not offer free domestic delivery but you are interested to buy a few things off their shop, feel free to chat with them and negotiate. Most of them are happy to give a little discount if you’re buying in bulk. As mentioned earlier, the local shipment handlers in Singapore are Singpost (Speedpost) and Airpak Express. While Singpost had never once given me any issues, I was quite annoyed with my recent poor experience with Airpak Express. I was notified on Taobao that my shipment had arrived in Singapore and would be delivered on this particular day so I made sure I stay at home to wait for the delivery guy. No one came and I received an sms at 6.30pm that the delivery attempt failed and there was a number I was supposed to call. Tried calling numerous times – no answer. I called the next morning several times and someone finally answered my call at around 9.15am. She sounded very unfriendly and didn’t seem willing to assist me. I said I needed the delivery to come on that day because I would be away the next day. She said the driver wasn’t able to complete all deliveries the day before so I didn’t understand why it would be a failed delivery attempt when no one came and they sent my stuffs back to the warehouse and expected me to reschedule the delivery. She said she would try to reach the driver and call me back. One hour later, no one called so I called back the number and got another lady to assist me who managed to contact the driver and arrange for the delivery. I managed to get my stuffs by noon time. And this was the same shipment whereby my dinnerware ended up broken. My worst Taobao experience ever! In another previous purchase, I had encountered an error on Taobao website whereby I couldn’t combine one of the packages with the rest for shipping. When I contacted 4PX, they told me to pay the shipping fee for that package separately (they set up new link for me to add to cart and make payment). Only subsequent weight was charged, not by first kg. Thank goodness, everything arrived in good order in one shipment. In general, most of the sellers are quite easy-going. If something is damaged or not as what’s described, they are happy to make a refund to make things right as at the end of the day, they just want us to leave them positive feedback because negative ones will greatly affect their shop reputation. All in all, the whole process from online ordering to doorstep delivery took about 10-12 days which wasn’t too bad. Things on Taobao may or may not be cheaper than you think especially when you buy heavy stuffs like furniture, home decor items, etc. Product price may seem cheap at first but don’t forget there will be shipping fee (by weight) to add on. For example, I had previously made an order of tableware (about 17 items in all including plates, soup bowls and tea cups) and paid just under RMB100 (approx.) SGD20 for everything. Sounded like a great deal. When the package arrived at the warehouse and was weighed by the freight forwarder, I saw on the system that its total weight was just under 10kg and it cost about RMB213 + 3% SURCHARGES (approx. SGD44) for shipping so total price for the order worked out to be SGD20 + SGD44 = SGD64. While that might be so, I still like shopping on Taobao because there are many things on there that I couldn’t find in Singapore – vintage-style or hand-painted tableware, linen cushion covers, patterned fabrics, photography props, particle counter (hubby wanted that to measure air quality at home during haze period) and many other interesting kitchen gadgets and knick-knacks. It all depends on what type of products you’re buying and whether you’ve picked the most competitively priced among others. I must say clothing is generally inexpensive on Taobao plus they are not heavy so will not incur a lot of shipping fee but quality and sizing can be a hit or miss. Some cheap buys I had gotten in the past included hair/beauty accessories, photography background props (incl. artificial flowers), cute pouches, hand towels, baking cups, coasters, chopsticks, etc which cost from as low as S$0.10 to S$0.20 each. Shipping fee was also insignificant as the items weren’t heavy. Have fun exploring Taobao! 🙂 And feel free to leave a comment below ⬇︎ if you have any questions. Hi! 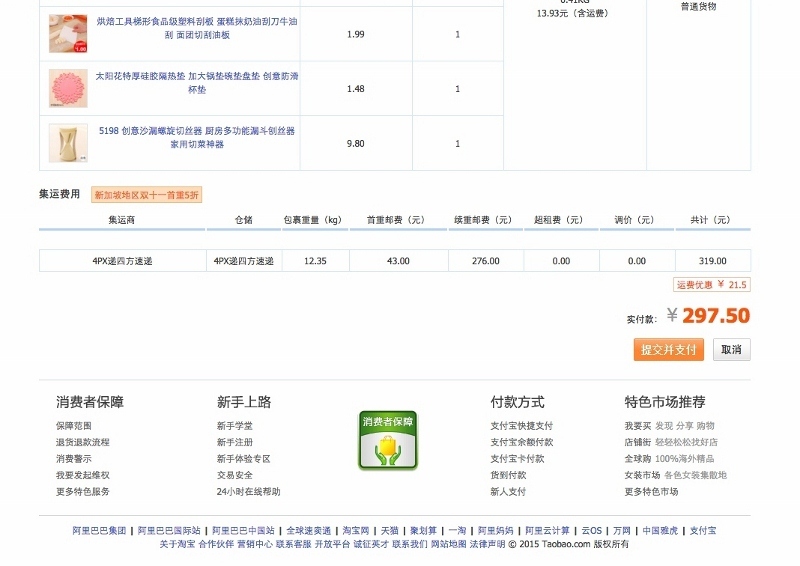 I just recently bought something on taobao for the first time and I’m encountering the problem where it says 等待仓库签收 and I have to pay 4¥ but it seems that I can’t pay with my DBS card. You mentioned you contacted your freight forwarder, May I know how you did that? Or is there anything I can do? Hi Jane, did your selected freight forwarder confirm receipt of the package and that you couldn’t select it to combine shipping with the rest of your orders? If so, you can contact them directly using the Aliwangwang messenger service. They should set up a new link for you to ‘purchase’ and make payment separately for the shipping for that particular order. Hi thank you so much for your prompt response. It now says 包裹签收成功 and I haven’t paid anything or contacted the forwarder (I’m using lazada). So do I still need to contact lazada for further payment to process my shipping?? It means your package has arrived at the freight forwarder’s warehouse. You just need to consolidate your orders 合并订单 (if you have more than 1 order), submit your shipping order and then make payment for total shipping fee. 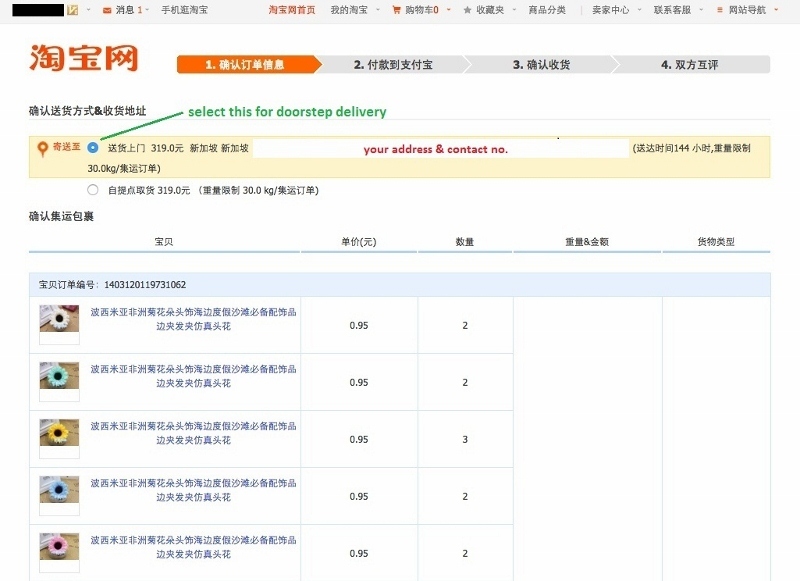 If there’s no error encountered, then there is no need to contact the forwarder as it’s a straightforward checkout process for shipping on Taobao. Go to 我的淘宝 -> 已买到的宝贝 -> 官方集运 (left column) and follow the instructions to check out. hi, thanks for this. It’s really great to have this guide. May i know if we will know the overseas shipping charges at Taobao web or only when it reaches freight forwarder’s warehouse? I’m glad this guide comes in useful for you. You’ll know the amount only when items reach warehouse as the packages have to be weighed before shipping charge can be consolidated & calculated. Alternatively you can write to individual seller to ask for the weight of the item (after packaging) to calculate the estimated shipping yourself. Hello, thank you for your detailed guide, it was very useful for me. But I’ve encountered some issue and hope you could help me. It is my first time shopping on TB, and I followed your guide till the point where I was supposed to make the payment. But I was lead to the alipay site and prompted that I could only pay for max 20 items (out of my 29 items) in my cart. Then the site started to have error so I refreshed my browser and logged onto TB again. But now my items were converted from my Cart to “items I have purchased 已买到的宝贝”, so now I want to make the payment again but I could not select all 29 items in 1 payment. My payment had to be separated into 3 times. What should I do? Should I make my payment 3 times? (Will this affect my consolidated shipment?) Pls help!! If your items are now under 已买到的宝贝, it means they have been paid for successfully. 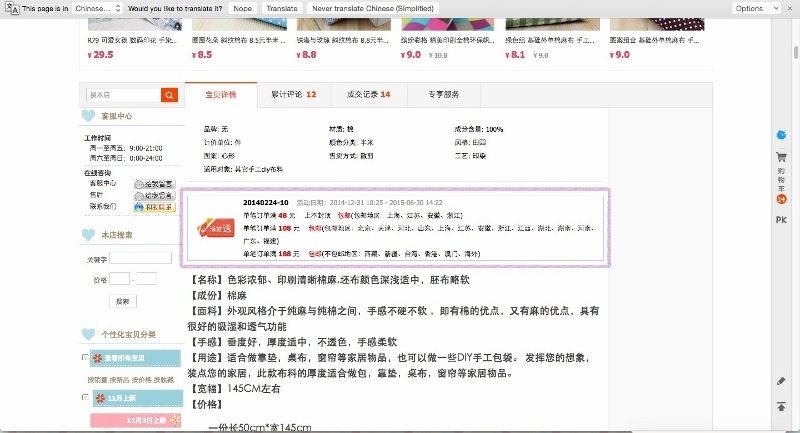 Click on 订单详情 on the same page for every order to check on status. If payment has been cleared, you just have to wait for sellers to dispatch your orders to the warehouse. At any one time, we can check out 50 items in one payment. If you’re facing difficulties, I suppose it’s because you’ve ordered 29 items from more than 20 different shops/sellers as 20 is the max. for each consolidation shipment. Depending on which freight forwarder you use, do note there is a cap for weight limit as well so if you’re buying bulky/heavy items, that may be an issue too. Your payment should be separated into 2 times if you did order from 21-29 different sellers. All 21-29 parcels will still go into your freight forwarder’s warehouse and will be stored under your account. When 20 parcels have been received, you may want to check those out in one shipment first. And then check the rest of the parcels out in a separate shipment. In this case, for your 2nd shipment, you’ll have to pay the initial 1kg shipping fee + additional per 500g as it’s considered a fresh shipment and not an addition to your first. You’re welcome. 🙂 Happy shopping! Hi, this a very useful guide for buyers in Singapore. Thanks!! My Q is this: do you know how the vPost (from Singpost) service compares with the freight forwarders you mentioned in terms of costs and service? I will check those out. I’m worse than you in terms of Chinese knowledge – I only know a bare handful of works like “big” “small” “school” and my name! So, I have to depend on Google Translate (web version) and use the Chrome browser (as you’ve also suggested). 1. You should update your guide to include the Google Translate apps for phone or tablet. 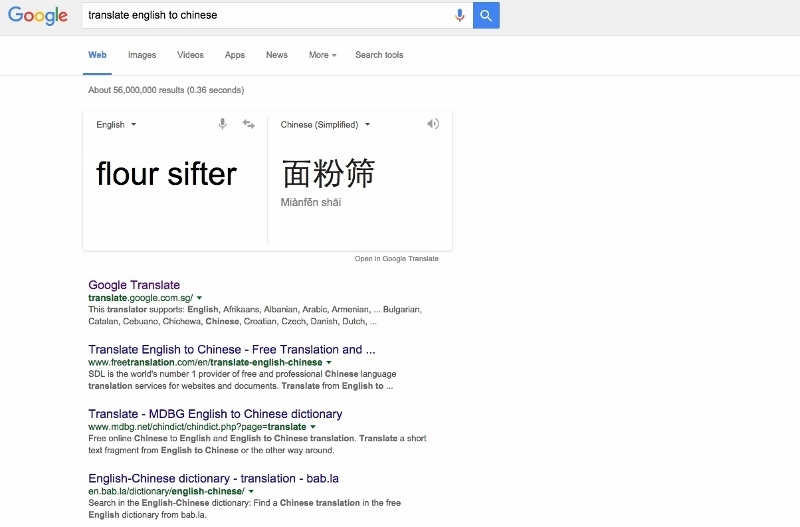 You hold your phone/tab and hover it over the Chinese words on-screen and you see an instant translation (search Youtube for demos) – magical! 2. You suggested switching the region from SG to Mainland China – why ah? Is there a difference? I switch region from SG to Mainland China because delivery is to be made to a warehouse within China. If SG is indicated, shipping fee will reflect overseas shipping prices for some and also, it will not be possible to add items from certain stores too if they only do local mailing. Hi! I hope you still do check this page every now and then because I have a question. After checkbox under 淘宝集运 (consolidated shipping) is checked, my shipping cost became “Ordinary delivery courier ¥ 800.00” so I am scared to proceed. Will the price be readjusted later? No, shipping fee will not be adjusted. Whatever your chosen freight forwarder quoted you is based on the total weight of all your packages and you’ll have to pay the shipping fee upfront before they activate delivery. 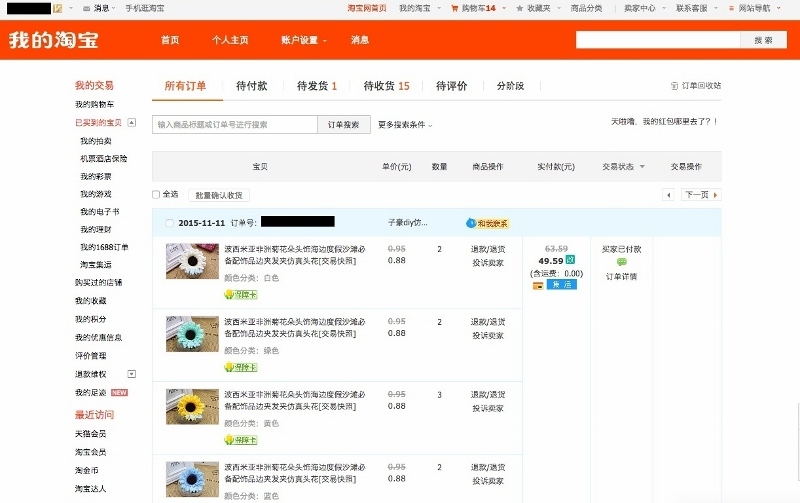 hi, i just made my first purchases (bought 4 different items from 4 different sellers) on taobao 2 months ago, but its all stuck at a warehouse (广东省东莞市 沙田镇 大泥村临海北路5号中通快递B栋四楼新马集运仓). i have no idea what to do now. from my limited understanding (of chinese likewise) of my correspondence with taobao, they seem to keep asking me to contact the warehouse. i have no idea how and what i should do. would be very grateful if you could help me. 2 months ago? Might have exceeded the holding period. You’ll need to contact the freight forwarder directly because there will be extra daily charges payable for exceeding the maximum storage period. Go to 我的淘宝 -> 已买到的宝贝 -> 官方集运（left column) and contact them via the Aliwangwang chat program (blue icon). From that same page, you can also check out the 4 orders in one shipment, pay for the extra storage charges (if any) and shipping fee to have them activate delivery thereafter. Wouldn’t the freight forwarder have your email and so on, and contact you when the expiry date nears? To alert you in case you forget. I know vPost works that way. Nope. Doesn’t work the same way for Taobao. We have to keep track ourselves. Hi! This is my first purchase from Taobao directly, and i’m terrible at chinese😅 May i know what does 包裏已出库 发往起运国海关清关 and 干线到达成功? Does that mean that my goods have cleared china’s custom and is on it’s way to SG/ or have already reached SG? Or does it mean that it has just arrived at china’s custom? Hope to hear from you soon, and thank you so much in advance for helping me out with this as i have seen these two sentences quite frequently on my parcels (yes bought quite a number of items even though it’s only my first purchase from taobao haha) but i have got no idea what do they mean. 包裏已出库 发往起运国海关清关 means the package has left the warehouse (in China) and is on its way to the destination country. 干线到达成功 means it has arrived at the destination country. Hi, I’m at step 7: Selecting a shipping opinion, but in my order, it show a text “我会自行联系卖家寄送至海外收货地址” and it go throuh to step 9, skipping the “Selecting a freight forwarder”. What can I do? 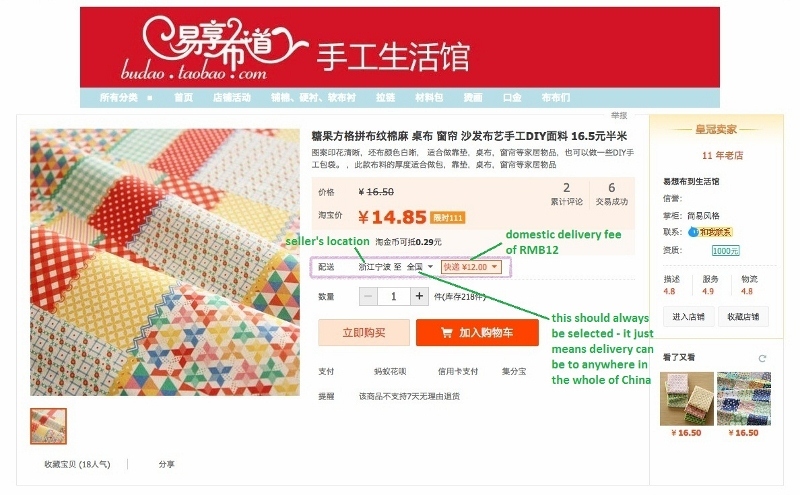 我会自行联系卖家寄送至海外收货地址 means you will contact the seller directly to arrange for direct delivery to your home. In this case, most likely, you’ve not selected China as your destination country when you were making your purchases or the seller that you’ve ordered things from does not deliver to warehouse for consolidated delivery to overseas. You’ll have to check your order again. Cancel it if need be and re-purchase your items. Hope this helps. I live in Vietnam and when i was at the step 2: “Select 海外其他 (Overseas/Others) from the 所有地区 (Region) drop-down menu and input your address and contact number. Once done, click 保存 (Save)”. Does it mean I should select my real country instead of China? Because when I select my country, all the products which I trying to buy will show the text “我会自行联系卖家寄送至海外收货地址” but when I exchange my addresss to other country like Singapore, it does not happen and go like your guide. Is Taobao not ship to my country? I’m not sure about Vietnam so you’ll have to check with Taobao on this. Hello! I just made payment for my items and after that do I need to do anything? Or I could just wait for them to contact me in regards of shipping payment? Cause it shows “包囊正在等待揽收” and I did not select any freight forwarder either. Ok, that means you did pre-select a freight forwarder. Nope, only click on that when you’ve received your item in good order ‘cos once you click confirm, Taobao will release payment to seller and you can’t raise dispute if there’s anything wrong with your order. Note you can extend the date of delivery once if it takes longer than expected. Hello! Is it possible to buy liquids (inks) from Taobao and have it be shipped to Singapore? I’ve heard of people doing it before but I’m not sure if the procedure is the same or if there’s any additional steps/restrictions. Thank you! Sorry I can’t help as I’ve not bought inks before. You’ll have to check with Singpost or customs for more info. Great article!. I liked it very much wile reading it full. and comments are useful and knowledgeable as well. Hi! I really need help in here and hope you could assit me! This is my first time ordering and I saw you are able to consolidate you item to check out via 1 time payment. However on my end, it seems like the items were not consolidated and i have to make payment item by item from different seller. It is the norm? I tried going back to see if i can consolidate but it dont allow me to. I have tried cancelling but noticed I cannot cancel more than 10 orders a day. Right now i am stuck in a situation where the system need me to make payment before i can proceed with adding new orders again. Do you know how can i proceed from here please? Did you manage to sort out the issue in the end? I’m not sure what’s wrong as I haven’t encountered the same problem before. Did you have too many items in your cart? If so, you’ll have to split them up into different batches but while doing so, you should still be able to consolidate items per batch. I wished i had chanced upon your article before i did my impulse night time taobao purchase! i simply entered a Singapore address and now my items have reached a warehouse but im not sure what im suppose to do now! Hi, just to check with you, how do you pay in sgd? I tried to purchase and will be convert to US. im not sure what should i do. Please advise, thank you in advance. 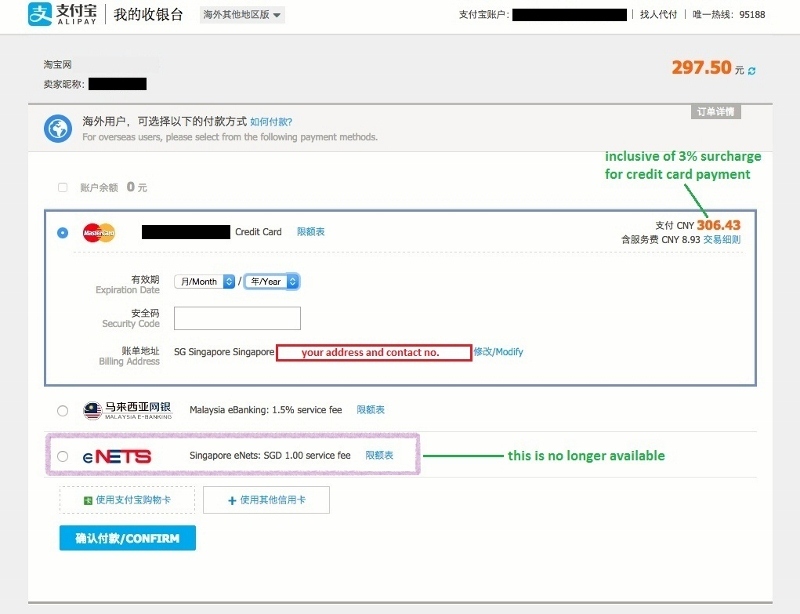 Payment is made in RMB which will then be converted into SGD when your credit card statement comes in. If you select Mainland China as your main destination, all prices should be in RMB, not USD. hi when i wanted to add my item to cart, under “配送 ” there is no “全国” option.. what should i select?. You can select the state/province based on your freight forwarder’s warehouse address. Hi there! Thanks for your detailed sharing. I was trying out TB and encountered some issues. Initially, my products on their own can be sent by 直送 but when I added another 5 more items, it changed to 集运. Do you know why this is so, and how it can be corrected? Also, is it possible to change our credit cards once it has been added in? There was also I landed at the Credit Card page on my laptop and they asked for some 支付宝 details (which I don’t have), and it was only when I used the mobile app that I managed to pay – do you know why this is so? Many thanks! Hi, the first issue is probably because not all sellers do direct shipping to overseas so if you can’t combine them into one shipment, you’ll have to separate them. 支付宝 is Alipay which is the payment platform that Taobao uses for all transactions (to sellers for payment of orders and to freight forwarders for payment of shipping fees). Yep, you can change your credit card. 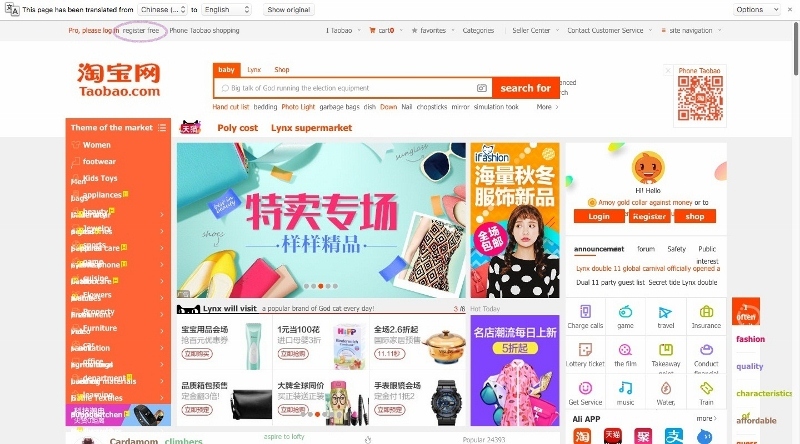 Just log into Alipay (icon on homepage of Taobao.com) and use the same login details as Taobao. You can then manage your 银行卡, either change or add on another credit card. Hi, if your package contains a prohibited item, the warehouse should have rejected acceptance of delivery and have the courier person return the package to the seller. So you might want to check with Lazada first on the status of the package – find out where it is now and if they have returned the package to seller. If so, you can apply for refund and the seller should process and approve it when he/she receives the returned package. If I remember correctly, they indicated on Taobao as 14-20+ days. If nothing has been updated, it probably just means your items are on transit to Singapore. You can check with the freight forwarder to reconfirm the status. And to add, you’ll have to give allowance for 2-3 days extra to clear China customs and SG customs. Hello! I have ordered quite a numbers of items from TB on 11/10 and now it still stated delivery to warehouse. How do i know it’s ready reached warehouse? where can i checked? 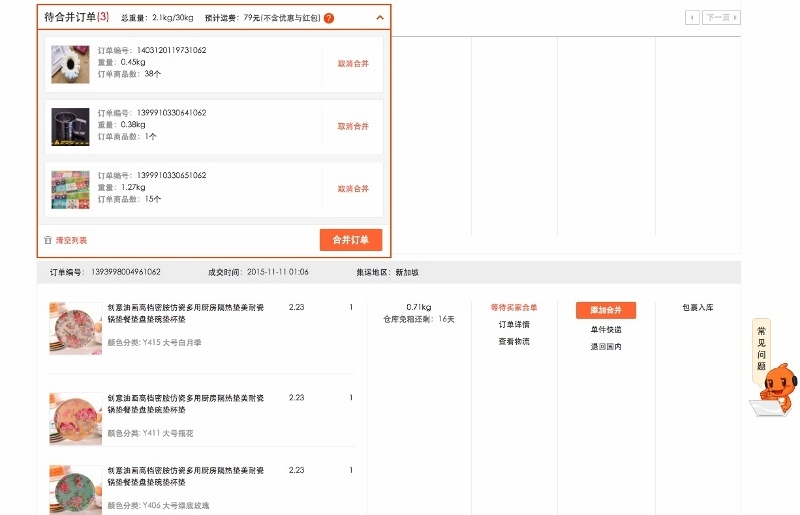 If the package has arrived at the warehouse and the warehouse has received/processed it, the delivery status should reflect ‘入库’。Go to your order list at 已买到的宝贝 and look at 物流 for the delivery status. 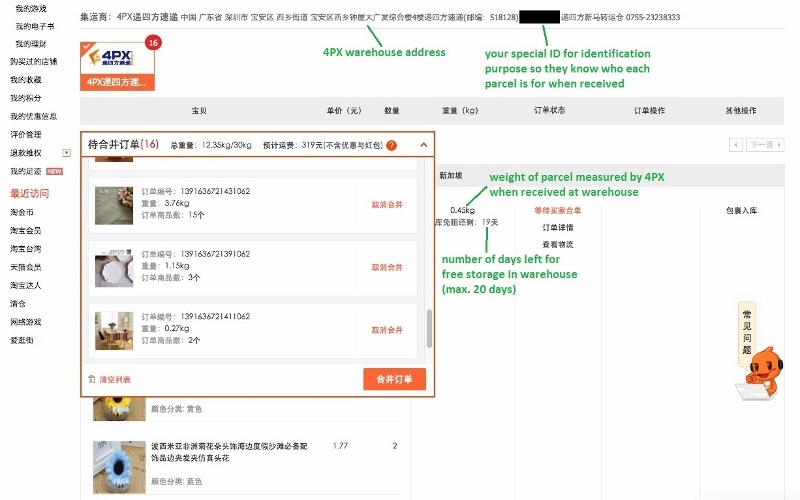 If it says 仓库已签收，it means warehouse has received the package but has not processed it. Sometimes there can be delay because the warehouse is overwhelmed with packages to process. 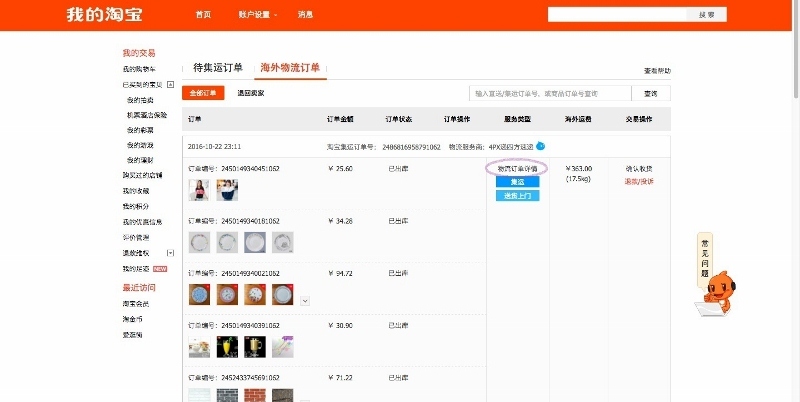 Only when all your orders have 入库, then you can proceed to combine orders for shipping. Maybe you want to consider lodging a police report? In this case, your town council should be able to provide CCTV footage to track down the thief. And with the evidence, you can then go back to SingPost to lodge a formal complaint. The parcel has to be received in person by someone at home, not just left at the door without your consent so the particular delivery person has to be held responsible. May I know how to return and refund poor quality taobao products from Singapore? Singpost is expensive to ship them to China for refund. Unfortunately, there are no options for return and refund for us. It’s just not worth paying the return shipping fee. This is one of the risks for buying stuffs on Taobao. However some sellers are willing to refund even though you do not return the products due to manufacturing defects, etc so you’ll have to check with individual sellers. Hey there, I’m from Mexico and I want to know if I can pay with a debit card, it is a MasterCard but I was wondering if only credit cards were accepted, thanks in advance. As it is still a MasterCard, there shouldn’t be an issue. 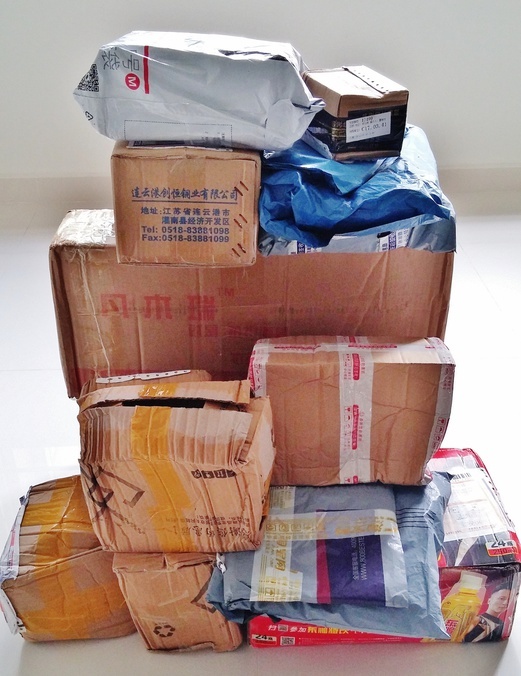 Many of the shipping methods stated above are no more available in Taobao. 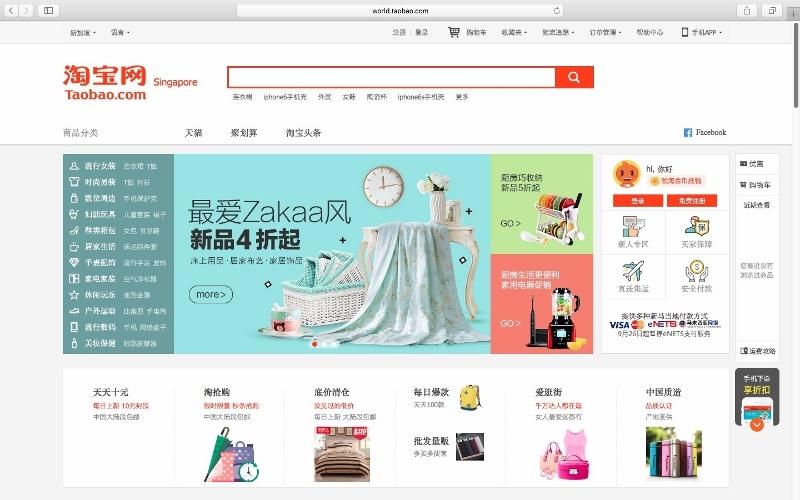 Currently, there are air & sea shipment that are currently owned by Taobao, & only Lazada sea shipment is third party. 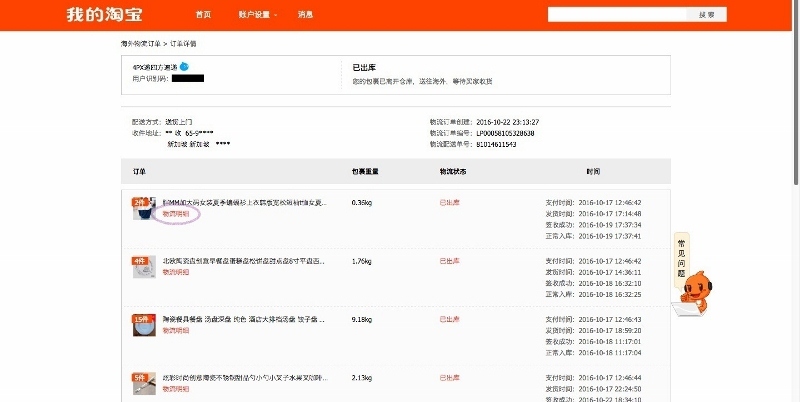 CaiNiao sea shipment, though stated in their shipping page that they charge small item by volumetric weight, but it’s up to their discretion to charge u by packaging dimensional calculation once the items are in their warehouse. i can assure u that the physical item that weigh 1 or 2 kg can be charge for 7 or more kg. Hi, great article and really infromative. 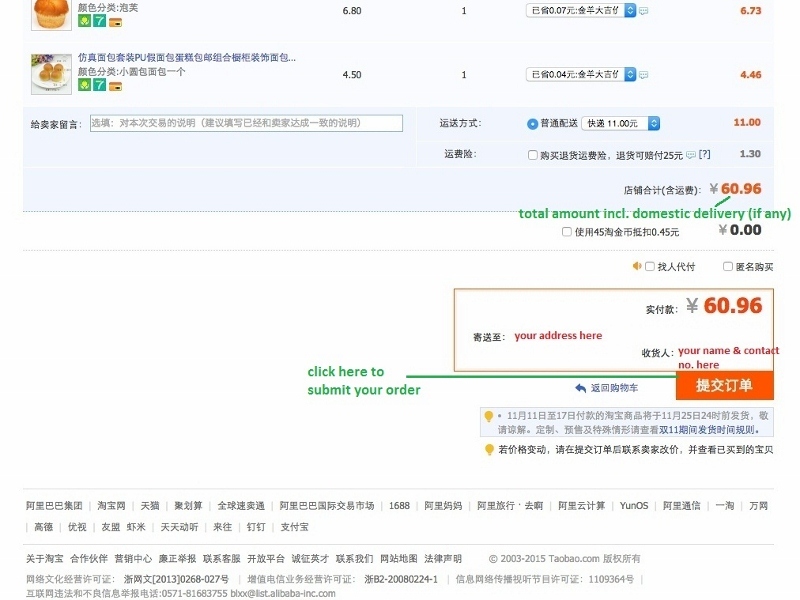 I have ordered quite a few things from TaoBao now and I like how fast you can get the items. Recently I had a store owner (Seller) on Taobao ask if could leave them good feedback. I want to do it but I am unsure how to do it, can your help me out? any help would be great. Go to 我的淘宝 -> 已买到的宝贝 （list will show your recent orders/completed transactions). Under each completed order after you have acknowledged receipt, there is a tab on the right hand side that says 评价。Click on that and you can leave feedback for each item you bought. Hi. Desperately need help .First time using taobao and I chose direct shipping. I have packages that are under 中通快递，申通快递and韵达快递 but idk what will happen when they reach Singapore .Currently one package is (跨镜）到达分拔中心. In case I miss delivery idk who to contact helpzzz. Idk who is responsible for delivering in Singapore .I tried googling and contacting but still have no clue. These China freight forwarders have different partners in SG so there are no specific persons or companies we can contact. It’s really up to the local courier service to contact you if there’s no one at home to receive for example. Some will probably just leave the packages at your door or pass to your neighbours. You may want to contact the China side and ask for direct contacts in SG if that helps. Hello! I recently bought items on early march, but I’m not received yet. when I checked the logistic, it said that “Your parcel has been put into storage. If the logistics information has not been updated for a long time, it is recommended to consult the courier company”. I not sure what to do since I depends everything on google translate. Please help. If your parcel has been put into storage, it means you have selected freight forwarding service instead of direct shipping by seller. You’ll need to pay for shipping (to Singapore) and the freight forwarder will process straightaway and have your parcel delivered to your doorstep. Go to 我的淘宝 -> 已买到的宝贝 -> click on 合并转运 to consolidate your orders and pay for shipping.